d Bethpage) was held in the Theodore Roosevelt Republican Hall. Thirty-five people attended and $8 was collected. Pastor William Rusch of Hicksville offered to conduct services on Sunday afternoons at the firehouse on Stewart Avenue (across from the present site of St. Paul’s). The first worship service was held on March 11, 1923, 75 attended, and an offering was received in the sum of $17.18. The name of St. Paul’s was chosen and the first officers were: Henry Schaaf, Chairman; Theodore Damm, Secretary; and Edward Sengstacken, Treasurer and Superintendent of Sunday School, positions which he held for many years. The present property was purchased and in November, 1923, work was started on the church building. On November 25, 1923, the cornerstone was laid. The church building is unique in that the members gathered from nearby areas, all the large stones that comprise the outside walls of the church. In a few months, services were held even though there was no heat except for a wood-burning stove. The church was dedicated on September 28, 1924. The building, lots and water came to a total of $16,522.14. The Dorcas Aid Society was started on May 31, 1923. A choir was also started shortly thereafter. The parsonage was on Lafayette Avenue (Ludwig home). The Walther League (young people’s group) was started. members Deborah C avacchioli and Kathleen von Thaden served as the preschool’s first directors. The staff of twelve educators also included St. Paul Lutheran Church members Celia Bernhardt, Joanne Foley, Jeanine Martin, and George Stark. Little Gospel Lights Preschool offered Christian education classes for two, three, and four-year old students. On June 26, 2002 at just after 6:00 p.m. lightning stuck our beautiful St. Paul Evangelic al Lutheran Church. We give thanks to the Lord that no one was in the building, when the fire broke out, however, our church sustained quite a bit of interior damage. Our organ pipe room, chancel and parish hall were destroyed. In addition to the fire damage there was additional damage due to smoke and water in our basement. An aggressive building project was begun and the congregation under the leadership of Pastor Ancira, with assistance from the community of Bethpage, banded together to see our beloved church re-built. 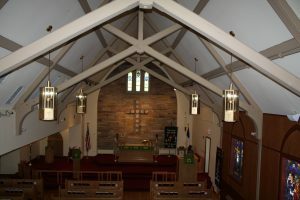 In August, 2004, we re-entered the newly re-built St. Paul Evangelical Lutheran Church which is now capable of supporting multiple classes and meetings.